The badminton backhand stroke is many people’s main weakness. They tend to get the technique for this stroke wrong. It’s important to keep in mind that the backhand stroke for badminton is NOT like a tennis or squash backhand! The CORRECT technique to perform a badminton backhand stroke is more complicated than a tennis backhand. Many people (casual or amateur players) tend to perform their backhand in badminton like a tennis backhand. That is why they fail to generate power with their backhands in badminton. Besides, it’s IMPOSSIBLE to perform high quality backhand shots if the technique is poor. Therefore, avoid the common mistake of swinging like a tennis backhand. Correct backhand technique: Similar to the forehand, you make a complete backhand swing to generate the power to hit strong backhand shots. The backhand swing pattern for badminton is very different from tennis/squash. Squash/Tennis: The backhand is performed in such a way that the tennis ball is hit from the side of your body. Badminton: The correct technique for a backhand stroke will allow you to hit the shuttle at your backhand area when it’s in mid-air (above your head).Therefore, the swinging pattern for badminton is very different. It’s only with correct technique that you’ll be able to generate a lot of power as well as perform quality backhand shots. The tutorial below shows you the correct technique for a badminton backhand stroke. Backhand Grip: In order to perform a good badminton backhand stroke, use the backhand grip. Wrist action: Wrist action in badminton contributes a lot of power into your shots. Practise the correct way of flicking your wrist to generate the power. Don’t hold your racket too tightly and don’t tense your arm muscles. When your muscles are too tense, your wrist will not be flexible to do a quick flick. You would be facing the front of the court at your initial position. From there, slowly turn your body facing to the back (see picture above). Position yourself for a backhand. While turning your body to the back, raise your racket to the position similar to the picture above. Keep your racket arm as close as possible to your body (see picture above). This is to ensure a complete backhand swing can be performed. Remember not to grip your racket too tightly. Gripping your racket too tightly limits your wrist movement. Just when you’re about to perform the backhand stroke, your body should already be facing the back of the court. 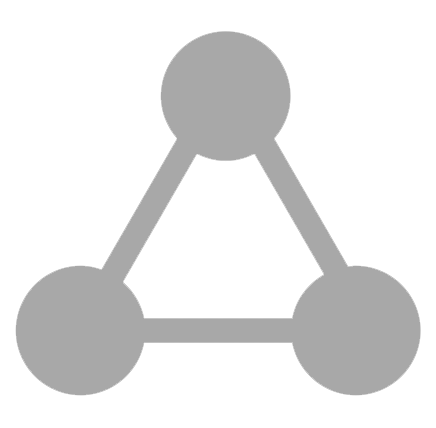 Note that the execution phase should be 1 smooth swinging motion. This part is important. 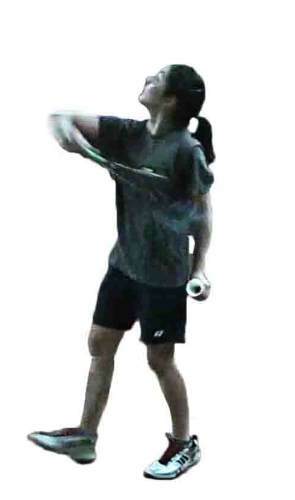 Raise your racket arm to the position similar to the picture above BUT DO NOT STOP at this position, it should be smooth and fast swing until you hit the shuttle. You’ll still have to complete your swing even after you hit the shuttle. FOLLOW THROUGH with your racket. Following through helps with accuracy. It’s not so much for power, the power came from the preloading phase and from the flick of your wrist. Therefore, as you follow through with your swing, there’s no need to add more power or else you’ll lose balance. The picture above shows you the position you should be in (after you complete your backhand swing). The badminton backhand stroke is NOT a tennis backhand. The flick of your wrist creates a powerful snapping motion. DO NOT hold your racket too tightly and DO NOT tense your arm muscles so that your wrist is flexible to do the quick flick.